It’s been a while since I posted! Crazy how time flies. 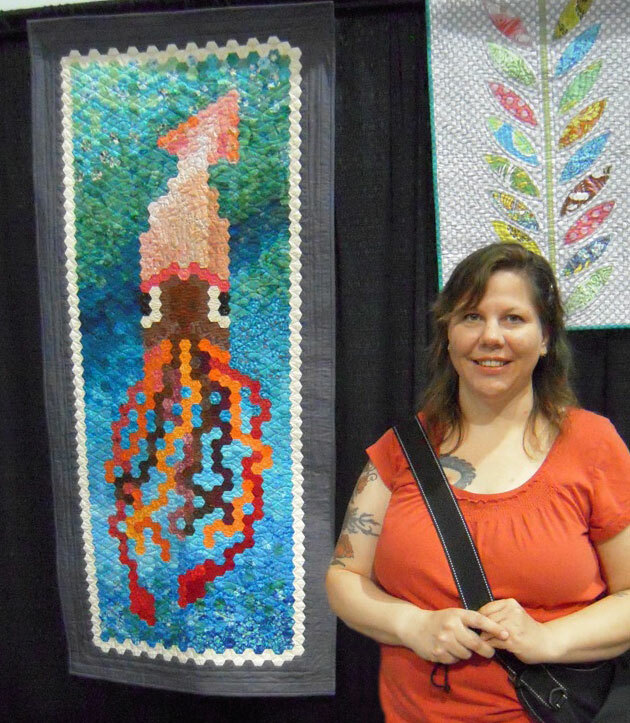 One fun thing that happened was the Northwest Quilt Expo show here in Portland. I went with my husband ~ that was an experience in itself… he’s never been to a quilt show before! We met up with some other PMQG members on Saturday morning, then veered off on our own little adventure. It was pretty great to see my squid quilt hanging someplace other than my sewing room! I wanted to take a bunch of pics of other quilts from the show, but (of course) my camera battery died. I have the worst luck with photography ~ oh well, got one of the squid and that was pretty cool. I am CRUISING on the Dragon Quilt right now… there are exactly 18 strips left to sew on, and one of those is only 2 pieces long!! I will be done within the month… and my goal is to sew on the borders and take all the papers out so the whole top is complete before our next PMQG meeting, and then I can bring it to show and tell! ~ I can’t even explain how excited I am to show it. Of course now the thing that’s rolling around in my head is how I’m going to quilt that sucker. I’ve pretty much decided it’s going to be done by machine rather than by hand, but I might add some hand quilting for accents and details. I’m thinking of having it basted on a long arm machine so I don’t have to deal with pins or glue… So I guess some things are figured out. Before I do any quilting on it, I think I’m going to work on a few small quilts so I can practice my free motion quilting again… it’s been a while, and I don’t want to start fresh on the Dragon… and over the last year of hand-sewing, I’ve put together a nice long list of machine-pieced quilts I want to make… so it’s time to get started! I was excited to see your Squid Quilt at EXPO! I'm intrigued by something in your post — you can have a quilt basted on a longarm machine? And then remove it and quilt it on a domestic machine? i just love your Squid Quilt, its beautiful!! Can't wait to see the Dragon all completed…you're so talented!! That squid quilt is so FANTASTIC!!! Well done!